“A dinosaur with a bird’s brain”. This is how the ex-President of Iran Hashemi Rafsanjani described the United States of America, evoking its great military strength but lack of strategic intelligence in foreign policy. Indeed, the very unusual meeting of the chiefs of staff of Syria, Iraq and Iran in Damascus this week would not have been possible without the latest US action in Syria. The US establishment has done a favour for the three countries aligned with the “Axis of resistance” by eliminating the “Islamic State” group (ISIS) in its last stronghold east of the Euphrates. 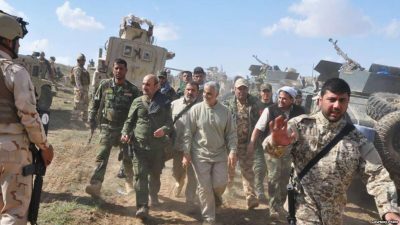 The US attack on Baghuz (east of Syria), done in conjunction with its Kurdish proxies, has led the three military commanders to decide to re-open the land road between Syria and Iraq, paving the way for a safe Iranian land passage to Iraq and Syria. This means the Tehran-Baghdad-Damascus-Beirut road is now clear. This is not the first time the US establishment has rendered substantial strategic support to Iran with its clumsy planning. When US President Donald Trump decided to pull out of Syria, describing it as a land of “sand and death”, he was serious about his plan. However, the US could not leave without first eliminating the ISIS pocket in the area under US control in the east of Syria, which would have meant leaving in place what has been the sole pretext for its occupation of the area. This is why Trump was advised to eliminate ISIS first and then withdraw his troops. He finally ordered his forces to do so after long months of inaction, during which the US effectively offered protection to the terror group and allowed tens of thousands of ISIS militants to move freely to attack the Syrian Army and its allies along the Deir-ezzour al-Bukamal axis. The significance of Trump’s decision to finally move against ISIS cannot be overestimated. Since 2014 the US has been engaged in a phoney war against ISIS, pretending to fight this brutal takfiri group while in fact allowing it to expand and killing Syrian Army soldiers who actually fought the group. Throughout this time the US has used ISIS as a pretext for the US military presence in Syria. The US did bomb ISIS occupied Raqqah and destroyed it; it then made a deal to deport many thousands of ISIS partisans. But the ongoing Battle of Baghuz marks the first time the US has really fought ISIS. To his credit, Trump is now doing what the US has only pretended to do for five years: actually fighting ISIS. This spectacular and drawn out campaign allows Trump to take credit for defeating ISIS, although for half a decade the forces actually fighting ISIS have been the Syrian Army, Russia, the Iraqi PMU/Hashed al-Shaabi, the Iraqi Army, Lebanese Hezbollah, and Iran. In Baghuz, US forces (and European allies) have bombarded ISIS to squeeze it into a small confined city. They succeeded in opening a safe passage for women, children, elderly, wounded ISIS militants, and many of those willing to surrender. Over 35,000 ISIS and families have come out of that small place. 9,000 militants have been wounded or killed. The US and their Kurdish proxy forces have managed to corner the remnants of the terrorist group in a small area less than 1 square km and are about to launch the final assault in the coming days. It is only a matter of time before ISIS gives up its last stronghold east of the Euphrates. The imminent removal of the ISIS threat provided the occasion for an unusual meeting. Iranian chief of staff Major general Mohammad Baqeri, Syrian defence minister Ali Abdullah Ayyoub, and the Iraqi Chief of Staff Lt General Othman al-Ghanmi met in the Syrian capital Damascus and decided to re-open the borders between Iraq and Syria. Trump and his generals recognised their mistake in creating a safe passage for Iran and Iraq into Syria by removing ISIS from that area. The presence of ISIS made it impossible for Iranian and Iraqi nationals and goods to travel safely to Syria. This realisation led to the US decision to leave several hundred US members of the armed forces behind. Thanks to the US move, Iran can now send all needed support and resume commerce with Syria, at a time when Israel has been bombing Damascus airport to try and slow down the re-supply of the Syrian army with precision missiles and other military equipment needed to rebuild the Army’s defence force. With the opening of a new border crossing between Iraq and Syria, the US occupation of the al-Tanf crossing becomes less significant. If the US tries to pressure Iraq to stop its commerce with Iran or Syria, Baghdad will ask for the departure of Trump’s forces from Mesopotamia. Trump’s decision also means that Syria’s economy will be able to regain some strength once the land road reopens into Iraq. The three military commanders had a good laugh about US policy and action in Syria. They have benefitted from continuous strategic mistakes by Washington since its occupation of Iraq in 2003 and the removal of Iran’s fiercest enemy, Saddam Hussein. ISIS remains a security danger but not a military threat. Its remnants can still carry out attacks against convoys or soft targets even after the joint agreement of the three countries to patrol the borders and help with their technology, intelligence, and soldiers to protect the al-Bu Kamal border crossing and join the efforts to combat ISIS. The US generally looks at the big picture, as its thinkers and planners plan to redraw borders, change regimes and create failed states. However, they sometimes disregard details that can turn a situation in favour of their supposed enemies, in this case, Iran. As Rafsanjani once commented, the US is “a dinosaur with a bird’s brain”. Not only Rafsanjani has made such caustic remarks. At a recent Iranian Revolutionary Guard Corps – Quds brigade event celebrating Commander Major General Qassem Soleimani’s success in Iraq and Syria, the leader of the revolution Sayyed Ali Khamenei said, with reference to the US (and Saudi Arabia): “we thank Allah, who rendered our enemies imbeciles”.